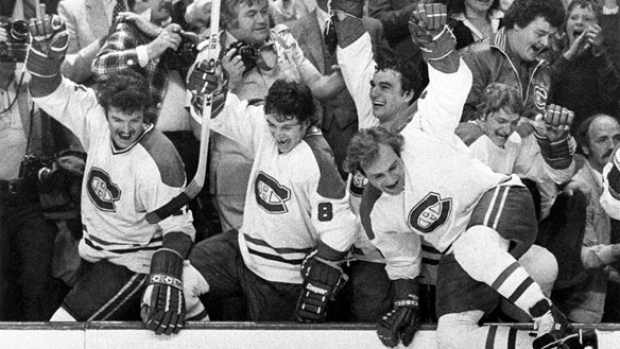 The top-seeded ’76-’77 Montreal Canadiens have looked like a favorite the entire tournament and now they are headed to the Ultimate NHL Final. They defeated the 4th-seeded ’73-’74 Boston Bruins in five games to clinch a spot in the Final. In Game 5, with a spot in the Final within their grasp, Montreal stormed out of the gates to score five goals within a span of five minutes and 12 seconds in the first period. Yvon Lambert got them started with his eighth goal of the tournament. Then, 28 seconds later, Larry Robinson scored his fourth goal of the tournament to make it 2-0 Habs. Then, 22 seconds later, Robinson potted his second of the game to make it 3-0 Habs. Then, two minutes and 55 seconds later, Steve Shutt scored his 11th goal of the tournament to make it 4-0 Habs. Then, one minute and 27 seconds later, Bob Gainey potted just his second goal of the tournament to make it 5-0 Habs before the end of the first period. It was after Shutt’s goal that Boston goaltender Gilles Gilbert was pulled for the first time in the tournament after allowing four goals on 14 shots and he was replaced by Ross Brooks. 40 seconds after Gainey’s goal, the Bruins got on the board with a goal from Ken Hodge and three minutes and 53 seconds later, Phil Esposito potted his 16th goal of the tournament. Espo’s goal cut the lead down to 5-2 and thats, finally, how the first period would end. The Canadiens outshot the Bruins 17-11 in the first period. Montreal would dominate the second and third periods in shots on goal, as well. Just halfway through the second period, the Bruins got another goal back when Derek Sanderson potted his fourth of the tournament. Sanderson’s goal made it 5-3 Montreal and the comeback more than halfway there. As the third period winding down, legend Bobby Orr scored his seventh goal of the tournament and made it 5-4 Montreal. However, the comeback would come up just short and the Big Bad Bear’s tournament would come to a close after an impressive run. So, the top-seeded ’76-’77 Montreal Canadiens advance to the Ultimate NHL Final over the 4th-seeded ’73-’74 Boston Bruins in five games. They will face the winner of the matchup between the 19th-seeded ’88-’89 Calgary Flames and the 23rd-seeded ’79-’80 Buffalo Sabres. Game 5 of the Semifinal matchup between the Flames and Sabres takes place tomorrow night! This entry was posted in Semifinal, Ultimate NHL Playoff and tagged Bob Gainey, Bobby Orr, Derek Sanderson, Gilles Gilbert, Guy Lafleur, Ken Hodge, Larry Robinson, Phil Esposito, Ross Brooks, Semifinal, Steve Shutt, Ultimate NHL Playoff, Yvon Lambert. Bookmark the permalink.